The public’s biggest concern when it comes to GMOs is their safety. There are a lot of misconceptions about genetic engineering. When pressed on science of GMOs, I have often heard people fear that the genetically modified material in the foods they are eating will somehow mutate their DNA too. While logically it sounds like that makes a bit of sense, scientifically its nonsense. As I explained in my review of the science behind GMOs, the actual genetic material being modified gets thoroughly destroyed in the digestive tract. But that doesn’t mean GMOs are guaranteed to be completely safe to eat – the protein products that the transferred genes encode for or other side effects of an organism creating those proteins could be harmful. So how do we test for and ensure that GMOs are safe? Allow me to introduce you to the complex world of genetic technology regulation. Genetically modified foods have a significant image problem and much of that comes from the laissez-faire apparatus that has been put in place to regulate them. Scientists, in effect, over-estimated the scientific sophistication of the public and assumed no one would conflate the genetic modification of plants for humans. How this oversight has played out in the regulatory arena is instructive in trying to decipher some of the hatred pointed at GMOs and other scientific advances that may come to pass. Right now, there is a lot of variation in the regulatory processes that monitor and label GMOs. Those that are tightest regulated are in the biomedical industry, where strict regulations on animal research in general ensure the ethical creation, treatment and use of GMOs. In the U.S., any procedure on an animal can be preformed if scientifically justified, though that justification isn’t always easy. Animals are regulated and protected under the provisions of the Animal Welfare Act and the Guide for the Care and Use of Laboratory Animals, published by the National Academy of Sciences. Any institution that conducts animal research must have a vet and an Institutional Animal Care and Use Committee (IACUC), which ensures that alternatives, including non-animal alternatives, have been considered, that the experiments don’t use more animals than necessary, and that pain relief is given unless it would interfere with the study. The IACUCs regulate all vertebrates in testing at institutions receiving federal funds in the USA. GM vertebrates purposefully bred for research are separately regulated under Public Health Service policies, and all of these regulations are enforced by the USDA, OLAW and the AAALAC. The hoops that researchers have to jump through to make and use GMOs are insane, though not in a bad way – they guarantee good science as well as the control and proper use of genetic technologies. As I alluded to, regulation of GM food is different. There is no worldwide consensus as to how to regulate GM crops or livestock, and depending on the political, social and economic climate within a region or country, the government oversight and opinion varies. In Europe, for example, anti-GM activists are particularly vocal. GM crops are today very rare in Europe. In 2003, the European Union adopted regulations establishing an EU-wide system to trace and label GMOs and to regulate the sale and labeling of food derived from them, although this legislation did put an end to the ‘de facto’ moratorium on approving new GM products for the European market, which had been in place since 1998. Regardless, these strict labeling laws and regulations ensure that GM crops don’t hit stores easily. These include systematic genetic testing for GMOs using DNA barcoding technology and assurance that non-GM crops do not mix with GM ones. In the United States, however, GMOs are much more common. The regulation is confusing because the EPA, USDA, and FDA all deal with different facets of GMOs. In short, the EPA evaluates GM plants for environmental safety, the USDA evaluates whether the plant is safe to grow, and the FDA evaluates whether the plant is safe to eat. This means that the EPA is responsible for testing and regulating GMOs with pesticides or toxins that may cause harm to the environment, like Bt corn, but not those that are modified only nutritionally or for other reasons like disease resistance. The USDA picks up where the EPA leaves off, including drought-tolerant or disease-tolerant crops, crops grown for animal feeds, or any fruits, vegetables and grains for human consumption. In general, the FDA focuses more on parts of things, not whole products. A box of cereal containing GM corn is regulated by the FDA, but the whole ear would be regulated by the USDA or EPA. In general, exactly what the FDA regulates with regards to GM foods is uncertain and confusing. To protect the environment and other creatures, the EPA conducts risk assessment studies on pesticides and establishes tolerance and residue levels for them. These regulations aren’t just GM-oriented – there are strict limits on the amount of pesticides applied to crops during growth and production, the amount that remains in the food after processing, licensing for pesticides used and directions for how to use them to meet the EPA’s safety standards. Inspectors periodically visit farms and conduct investigations to ensure compliance. When it comes to GMOs, for example, the EPA requires that growers have a license to grow modified crops, and requires those that do also plant 20%-50% unmodified versions to prevent insects from developing resistance to the pesticides as well as provide a refuge for non-target insects. The USDA has all kinds of specialized groups that share responsibility for assessing and monitoring GM foods, including the the Animal Health and Plant Inspection Service, which conducts field tests and issues permits to grow GM crops, the Agricultural Research Service, which performs the GM food research done by the USDA, and the Cooperative State Research, Education and Extension Service which oversees the USDA risk assessment program. In general, these groups check whether GMOs harbor pests, act as weeds, or harm native species that surround planted areas, including the effects of escaped GMOs. Depending on their findings, these groups can stop the production or movement of anything deemed unacceptable, and can even destroy anything that is in violation if their regulations. Once the food is grown and processed somehow to be used in food, it’s the FDA’s problem. In my opinion, it is here, at the FDA level, that the US has failed to adequately regulate and monitor GMOs, and this failure is partly at fault for the negative attitude towards GMOs held by many. By FDA regulations, agri-biotech companies may voluntarily ask the FDA for a consultation, including the evaluation of how eating the product affects people. Companies working to create new GM foods are not required to consult the FDA, nor are they required to follow the FDA’s recommendations after the consultation. The FDA does not demand special labeling of GM foods, as the FDA contends that GMOs are “substantially equivalent” to non-GMOs and are “generally recognized as safe”. The FDA could do a lot better, and needs to. How can consumers trust in a regulatory system that basically says regulation isn’t necessary? Here is where the politicians need to step in and demand more efficient, required testing of GM foods. Doing so might slow down the release of GM products, but it will give the public a reason to trust that when those products are released, that they really are “substantially equivalent.” In other countries there is even more variation in how GMOs are regulated. Some completely ban GMOs, not even allowing them to be tested and evaluated. Others plant them vigorously with no concerns towards their safety. What we need is a worldwide set of regulations that ensures the quality, environmental safety, and lack of adverse health effects of any GMO eaten by people. Hopefully, this list, combined with the information above, can give you some basis for your own opinions on GMOs. When arguing about genetic modification, remember that it’s not all about food – this technology is used for far more than Bt crops and fast-growing fish. Now that you have the back story, you can better understand the different sides of the GMO debate. What lies ahead for genetically modified organisms is uncertain. A lot of it depends on public opinion, which, right now, is extremely negative. There are definitely some concerns with GMOs that need to be addressed, including their potential interactions with wildlife and native plants, the societal issues of who owns GMOs and who benefits from them, and the ability of consumers to make informed decisions when it comes to their food. But it seems that most who dislike the idea of GMOs have few facts and don’t think of the many other uses of GMOs besides Frankenfood. Just look at the list of negatives – almost none apply to GMOs for use in biomedical research. Yet legislation seeks to prevent all GMOs wholesale – laws which would hinder medical advances. Anti-GMO feelings are spurred onwards by those who fear that by altering the genetic makeup of creatures, we are, in essence, playing God. It’s a line of thinking that feels anything unnatural is therefore unsafe – an entire culture of thought that thinks that anything produced by science or technology is automatically bad. Let me just share my two cents on this mode of thinking: first off, nothing about our lives is “natural”. We build things out of reinforced steel and other metals that never occur naturally. Houses never form in the wild, nor do clothes. X-ray machines don’t occur spontaneously, nor do heart transplants. So if you’re really dedicated to living naturally, you’ve got to rethink a lot more than GMOs. Secondly, we have been messing with creatures’ genetics and “playing God” for centuries. Over 50 million of us worldwide proudly own the products of this genetic manipulation – you might call them pets. Dogs, for example, have more physical variation within their species than there is in the entire rest of the order of carnivores. In other words, a pug’s skull is more different from a pit bull’s than a mouse’s is from a bear’s. If that’s not some serious genetic manipulation, I don’t know what is. We’ve bred not just different varieties of one species to create ideal plants, we’ve bred together different species, and long before we could do it with genetic engineering. Changing creatures’ genetics to suit our desires is nothing new. Thirdly, the transfer of genes from one organism to a wholly unrelated organism isn’t unnatural. Yeah, I know, the way we do it is, but it’s not like it’s never happened before in nature. Viruses and bacteria donate their genes to other creatures all the time – that’s why their machinery is often used to do genetic engineering. Even the transfer of genes between higher-order animals isn’t unheard of. We’ve found plant genes in sea slugs, for example – which is really, unbelievably cool, by the way. I’m not saying that we should all just go out and blindly trust Monsanto and the other GM producers. We shouldn’t just shovel GMOs down our throats and presume they’re safe and better for us. That’s what science is for – to test this kind of thing. 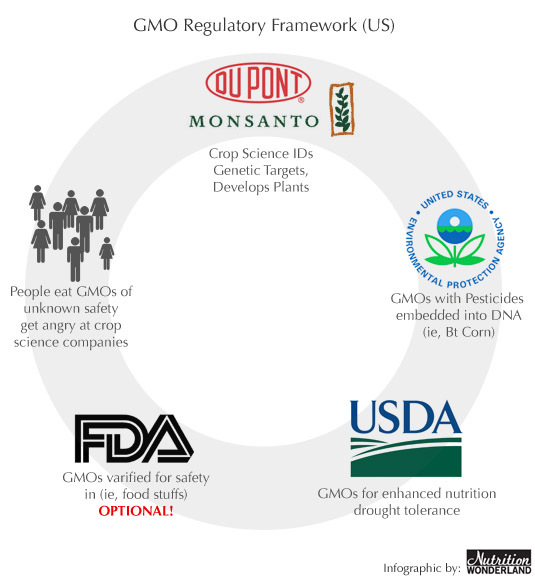 Have the lawmakers make stricter regulations regarding the safety evaluation of GMOs. Let scientists study and debate GMOs until they feel like they’re beating a dead FrankenHorse. Let it take years and years for these products to be tested, evaluated, and released. But don’t stop them from being created. Don’t make laws that outlaw the GMOs that are so vital to biomedical research because of fear. The reason Monsanto has a near-monopoly is because we stifle smaller companies and universities from competing with them, competition which is not only healthy but necessary – and we can fix that. In the end, the global benefits of the GMOs of the future are too great to be prevented by idealized notions of a natural world, and this is coming from an ecologist. Progress isn’t a dirty word, no matter what you hear, and we should be excited about the amazing possibilities that ever advancing technologies afford us. been upheld by judges resulting in lost farms. The loss of the wide variety of grains we have had is scary. It is not as though these losses can be easily regained or regained at all. Thank you for your honesty. This is an issue of classism that will affect the poor and the ignorant. Unfortunately the cross pollination of engineered plants will affect everyone and anyone, and this can never be altered or recalled. Monsanto and their sister corporations prey on ignorance and apathy. Every state should have an amendment which requires labeling of GMOs. While I am sure that your heart is in the right place, I feel you are unnecessarily demonizing a technology for how it may have been used by certain companies. This technology is extremely important for the goals of reducing pesticide and resource usage while still maintaining, and hopefully increasing, crop yields worldwide. Instead of going after a technology that has been scrutinized by many regulators and scientists for decades, you should be attacking the lawmakers that allow large companies to be the sole owners of products of these technologies. Some of the reason for this stems from the cost of the rigorous degregulation process that all GM products sold in stores must go through. Only large companies have the capital to invest in the R&D and pay legal and administrative costs for the deregulation of a single GM product. The company also has a patent on the specific transgene that they have inserted into the product. This is why the company can sue farmers for having that transgene in their crops without purchasing the rights to use it from the company. While this has no doubt been abused, these laws are in place to protect the investment of the company. These patents are not indefinite. They last for about 17 years. Therefore, these companies only “own” the rights to produce these products for a fixed amount of time, in which they try to recuperate their investment. This is the aspect of the GM food production process that I feel needs more attention. There should be an educated debate on the ability for a company or a person to patent a gene or genes. If it is allowed, what is the appropriate period of time for the company to maintain exclusive production/licensing rights? What can be done to ensure that these technologies can be utilized by NPOs and other philanthropic organizations? As stated before, the costs and time associated with deregulating a GM product for human consumption are staggering (about $10 million over 10 years, some GMOs can be a great tool for decreasing hunger and increasing wealth for subsistence farmers in the Third World, if they are distributed by an organization that does not have profit margins on their mind. 1. Companies working to create new GM foods are not required to consult the FDA, nor are they required to follow the FDA’s recommendations after the consultation. Incorrect, twice. A GM food product developed for human consumption in the USA must undergo an EXHAUSTIVE approval process overseen by the FDA, and for most of these products, there will be POST-APPROVAL monitoring of compliance by the FDA. 2. The FDA does not demand special labeling of GM foods,……. Again, inaccurate; The FDA does not require special labeling ONLY if the GM product is not MATERIALLY DIFFERENT from the non-GM equivalent. 1. \Companies working to create new GM foods are not required to consult the FDA, nor are they required to follow the FDA’s recommendations after the consultation.\ Incorrect, twice. A GM food product developed for human consumption in the USA must undergo an EXHAUSTIVE approval process overseen by the FDA, and for most of these products, there will be POST-APPROVAL monitoring of compliance by the FDA. 2. \The FDA does not demand special labeling of GM foods,…….\ Again, inaccurate; The FDA does not require special labeling ONLY if the GM product is not MATERIALLY DIFFERENT from the non-GM equivalent. This is a poorly written piece, and I am offended to have been exposed to this bit of durge. People who oppose GMO food aren’t people who fear technology or anything “unnatural”. Monsanto and their sister corporations prey on ignorance. It’s Natural to insist upon research for a product that is literally being shoved down the throats of the American people. Without proper information and labeling, parents and citizens have no choice but to feed themselves and their children a potentially toxic product. Wealthy and informed citizens will avoid gmo foods, while the poor and the ignorant will be a culled species. Before GMO consumers die of disease, they will have taxed the health care industries billions of dollars in disease management before they fall into painful and untimely deaths due to the consumption of GMOs through organ failure, infertility issues, and diabetes related illnesses. This is an issue of classism with Monsanto CEOs gaining wealth by ill gotten means. Shame on you Monsanto!! !